Reducing energy costs is a priority for many in the pig production industry with skyrocketing electricity, gas, and fuel prices ever on the increase. Biogas power generation presents a practical cost-effective alternative to mains electricity, while significantly reducing your farm’s greenhouse gas emissions, potentially by up to 80%. An Australian Pork Limited study showed that a combined heat and power (chp) cogeneration system provided the most substantial reduction in greenhouse gas emissions compared to capping and flaring or capping to use methane for heating alone. 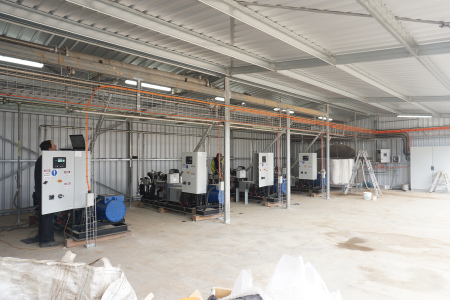 Inoplex CHP cogeneration systems utilise waste to generate warmth and power for use in various applications across the farm. What makes Inoplex cogen system unique? Reducing downtime when repairs are needed - many other systems require a company specialist to carry out any work, increasing expenses and potentially leaving the farm without green power and heat for extended periods. Much of the Inoplex Cogen system can be maintained by your local mechanic. Easily and inexpensively source replacement parts - Inoplex Cogen plant utilises motors and parts which are often readily available in rural areas. Generators can work effectively on lower levels of Biogas - allowing for better, more consistent, operation. Cogenerators can be powered by Biogas, LPG, natural gas, or petrol. You can maintain a clean, consistent source of power all year round. Load following ensures the system efficiently balances the required power and heat generation to current demand. Cogen generators can utilise all styles of biomass including manure, effluent, straw, meant, organic waste, rubbish, etc. Excess power can be sold back to the mains electricity grid providing another source of income for piggeries. Looking for a practical, efficient biomass power generation system for your piggery? Speak to our experienced team about an Inoplex cogeneration generator on 0448 307 282 or complete our online enquiry form today.